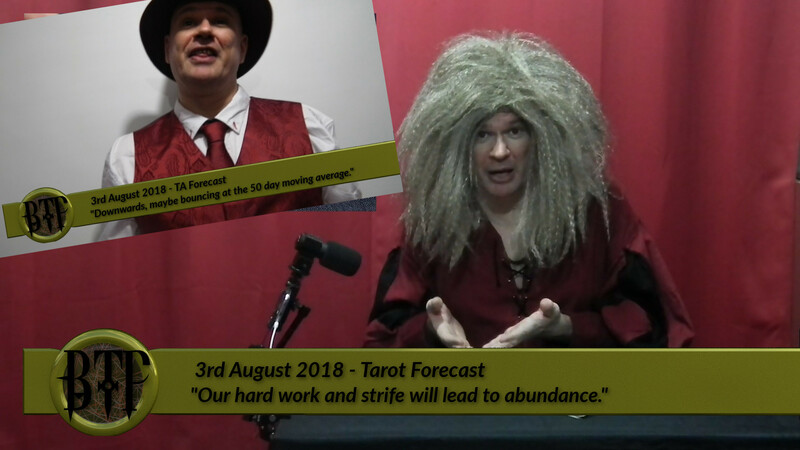 In last week’s #Bitcoin #Tarot #Podcast, Charting Chad predicted the price would be squeezed between averages and Cosmic Conroy predicted the up-cycle was at an end. Then the price was squeezed between averages, dropping as the up-cycle came to an end. Both good forecasts! But which forecast was judged better? And who takes the lead? And what will next week bring? And what’s this about someone sleeping with the judges? Find out in this week’s brand new episode of the Bitcoin Tarot Podcast in which we attempt once again to answer the question: Is Technical Analysis a load of old hokum? Is the Tarot any better? [Tarot-Synopsis] Our hard work and strife will lead to abundance. [TA-Synopsis] Downwards to maybe bounce from around the 50-day moving average.